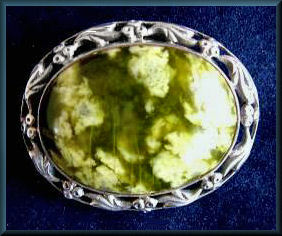 Small white and olive-green Late Victorian/early Edwardian sterling silver brooch set with polished Iona marble. No maker's marks. Approx 1.25 x 0.75". Typical of Iona marble brooches made by various silversmiths of this period. 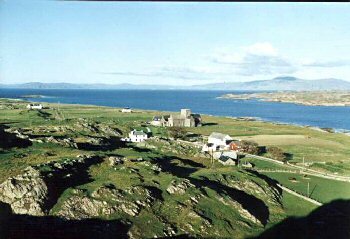 It seems appropriate to add to this website a section about the legendary stone called Iona Marble, whose source is a unique small geological outcrop near the south end of the island. This beautiful green and white local stone has been highly revered since prehistoric times. A number of coves and beaches towards the south of the island contain small pebbles of Iona Marble, polished for aeons by the motion of the tides, and finely coloured examples of the stone can be found by walking along the tide line, as Alexander and Euphemia Ritchie would have done to find pieces for their Iona jewellery. 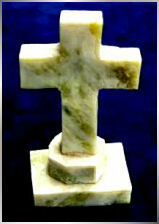 Small white and olive-green Iona Marble cross cut from a large smooth beach-stone found on Iona. I carved this when living on the island in the 1960s. Height approx 6"". Small Iona Marble beach pebbles often have more of the opaque green colour in them than this larger piece has. These beautifully coloured green and white stones have for centuries been said to be endowed with supernatural powers. Certainly Iona marble was well known in St Columba’s time during the 6th century. In medieval times a large altar slab was carved from it for the Abbey. This was subject to a curious and untimely end several centuries ago, as recorded in the 18th century by Dr Johnson (of Boswell and Johnson – who were travelling at that time in the Western Isles). The slab was lying in the ruined Abbey, and due to the local belief that Iona Marble, as well as having general healing powers was also a protection against shipwreck, fire, and miscarriage, local crofters and fishermen chipped small pieces off this slab to carry with them for protection. Over many years the altar stone finally crumbled, and it had completely disappeared by the time of Dr Johnson’s visit in 1773. Today there is a small inlet on the south east of the island called The Marble Quarry. This was named after a (perhaps fortunately) failed enterprise by the Argyll Quarry Company in the 1800s, which hoped to extract the stone and ship it from the island on an industrial scale. The remote and rocky location proved too hazardous for shipping, and today all that remains in the small inlet are the very rusted remains of a large winch and cable, looking both incongruous and almost ghostly against the backdrop of the sea. Since the 18th century small polished pieces of Iona Marble have been much prized by both collectors and jewellers. During the Victorian era especially, when Scottish jewellery became very fashionable due to Queen Victoria’s visits to and interest in the Highlands and Islands, jewellers made brooches and pendants incorporating polished sections of the green and white stone. Natural and stained Scottish agate was also much used, but Iona Marble will always be unique, and can be easily distinguished from the former stones by its beautiful green and white colouring. The Ritchies, as well as other early 20th century jewellers on the mainland and further afield, also incorporated Iona Marble into their island-based work, using it for items such as the bases of miniature Iona crosses (see an example on the “Crosses” section on this website), and also in silver brooches, pendants, and finger-rings. This tradition has continued, and jewellery using Iona Marble is still made on the island today. Due to the large demand for this green and white stone unique to Iona, much commercial jewellery sold after 1939 as ‘Iona Marble’ in fact was imported Connemara Marble from western Ireland, and not from the island itself. The difference is subtle but distinct, and once you become familiar with genuine Iona Marble it is quite easy to tell the difference. As during centuries gone by, pilgrims to Iona today still consider the small, finely-polished green and white beach pebbles to have sacred and healing properties, and they are kept, carried, or worn by devotees of the island all around the world. Iona marble is known by some folk today as ‘Columba’s stone’ and smaller sea-polished pebbles are known as 'Columba's tears'. A fine Edwardian Iona marble brooch set in a silver surround with leaf and berry patterning. The green nephrite or Iona Jade is particulary clear, and the stone is translucent when held up to the light. Size is 4cms x 2cms.